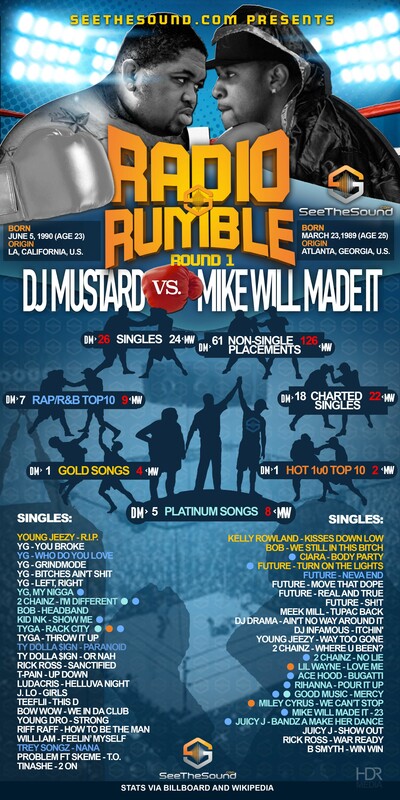 DJ Mustard vs. Mike Will Made It Who Yall Got? Cast Your Votes Below! Okay who do yall have? 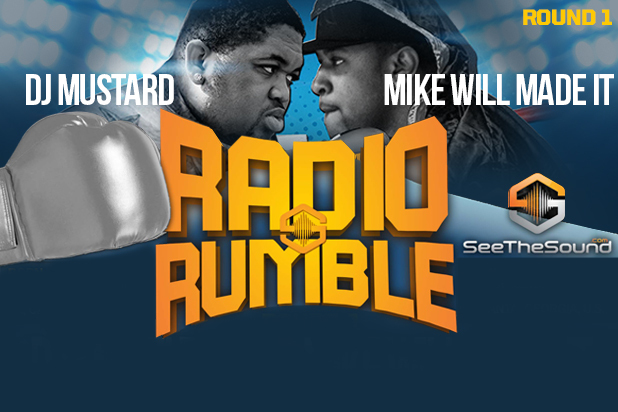 It’s a battle between the sounds of hit producers DJ Mustard and Mike WiLL Made It, two of hip-hop’s hottest producers in the game right now. Tell us who ya’ll feeling the most by voting below, make sure you guys check out the numbers as well when it comes to who makes more hit singles. Many people don’t get to hear the producer but they have a lot to do with the music we listen and love today. I know that many of us listen to a song and won’t even pay attention to the lyrics (Im Guilty LOL) we just bounce to the beat, more than likely created by some other person than the artist. Now this is when the question comes in. “Which producer is making us dance the most?” One of the dopest hiphop sites SeeTheSound.com decided to put the spotlight on two of the hottest and biggest producers in the game right now and putting them head-to-head in a online battle of production skill and expertise to see who’s hits hit the hardest! : In one corner we have Mike WiLL Made It of Atlanta, Georgia, and Cali’s own DJ Mustard of Los Angeles, California. Both Mike Will & Mustard are responsible for switching up the sound of mainstream hip-hop. DJ Mustard most known for his “ratchet” sound with placements on songs from Tyga, Young Jeezy, 2 Chainz, as well as with fellow L.A. owns YG. Mike WiLL, on the other hand, has collaborations with Drake’s right-hand man Noah aka “40” and trap OG Lex Luger, creating a significant sound of his own, which he’s used with hip-hop artists like Rick Ross, Meek mill,ludacris,waka flaka flame, Future, & Juicy J to name a few, as well as bringing it to the pop world with work from Miley Cyrus. This is a tough one for us so help us out and gives us your vote!